Mel Chua wrote a blog post about test-driven learning. When you’re learning on your own, you don’t have final exams to study for or a project that you need to submit, but it can be useful to think about objective criteria to show that you’ve learned something. Before you begin, figure out what success looks like. Define it so that it’s precise and objective. It has to be clear to you and other people when you’ve passed the test you’ve set for yourself. That way, you have a specific goal to reach for, and you know when you’ve accomplished it. If you’re looking for ideas for tests, you might want to check out Bloom’s taxonomy, which gives you different verbs that demonstrate different levels of understanding. For example, you might start off by checking if you simply remember the concepts by being able to list them. The next level above that is demonstrating understanding, and after that, applying it to your own life. With more experience, you can analyze concepts, evaluate approaches, or create new things. 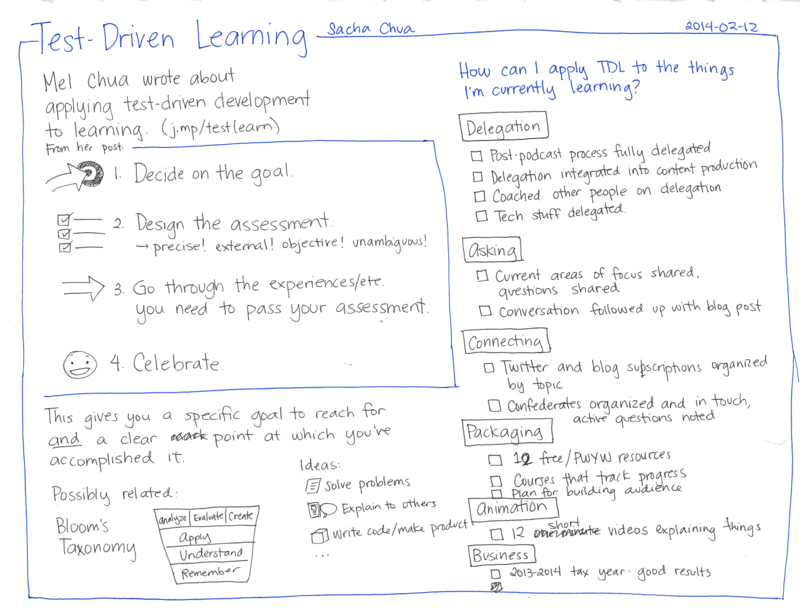 Inspired by Mel’s example, I’ve been thinking about how I can apply test-driven learning to the things that I’m currently focusing on. I’ve successfully delegated “Post show notes” three times. I’ve successfully delegated research, rewriting, and harvesting, each at least three times. In terms of asking people and learning from them, I think a key step would be being able to list the current areas of focus that I have and the questions that I’m exploring. I’m getting pretty good at reaching out to people based on their Twitter updates or other incidental connections, and a step beyond that would be to make sure that these conversations are followed up with blog posts that explore the ideas in more detail. This is also related to my focus on learning how to connect with people. One thing that can help me connect with people more effectively is to organize people by topic. That way, I can focus on specific groups of people instead of letting my stream be overwhelmed by people who use social media for promotion. In particular, I’m curious about the idea of building relationships with confederates, learning more about what they are actively learning about and sharing whatever resources and ideas that I come across. I’ve organized my Twitter into lists by subject. I regularly review each list for focused updates (one list per day), and I add people based on searches. I have a dashboard showing me my conversations and ideas to follow up on, and I have turned several of those ideas into blog posts. Packaging is straightforward to measure. I’ve published two free or pay-what-you-want resources in the past two weeks, and it will be interesting to see if I can sustain that rate until I get to 12 of them published. I’m also curious about creating courses that will allow people to track their progress, because I think will make that a lot more manageable for people to learn. Although these things are intrinsically useful and interesting, I also want to invest time in building an audience and reaching out to more people who can find these resources helpful. I’ve created 12 free or pay-what-you-want resources, and I have a resources page that lets people find stuff they’re interested in. I’ve tried out a course or membership plugin on my site, and I’ve converted at least one of the resources to a course. I have a plan for outreach, and I work on it regularly. Animation is similarly easy to measure. I created a number of short videos explaining things before, so all I have to do is make that a regular practice. Again, a target of 12 short videos seems like a good number. I’ve illustrated a course with short animations. In terms of business, it’ll be exciting to see where my third fiscal year takes me. It looks like I’ll continue consulting for the next year, so my assessment for myself might include maintaining profitability even with my increased delegation and re-investment, and developing systems around creating and sharing content. I file my next corporate tax return with all my is dotted and all my ts crossed. I’ve posted my analysis and lessons learned about delegation and reinvestment, and my plans for next year. I’ve written about this before, and every time I do, I learn something new. Other things I’ve learned about testing what you’re learning: sharing is an excellent way to test what you know, projects help you review what you’re learning, and breaking new topics down into small steps makes spiral learning more manageable. How are you going to test what you’re learning?